Acer has strived to create a working environment that fosters staff who are passionate, positive, and dare to dream, and this entails consideration and communication that supports and encourages the team. 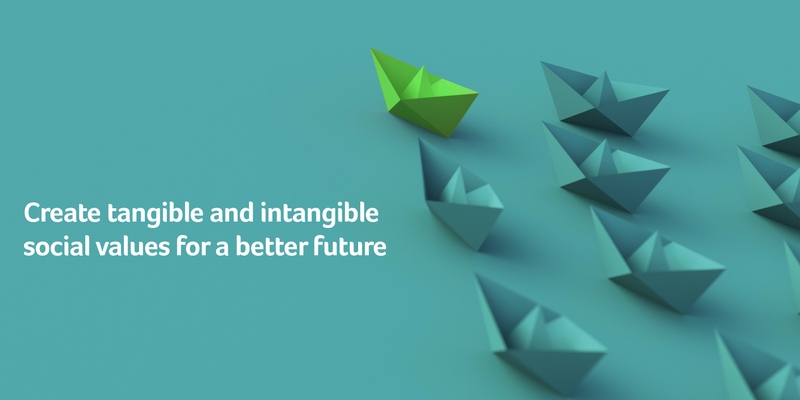 Through a competitive compensation package, we have been able to attract and retain outstanding talent; by promoting work-life balance, we show we care about our staff health, both mental and physical; and through systematic training, we create the power to change the world. 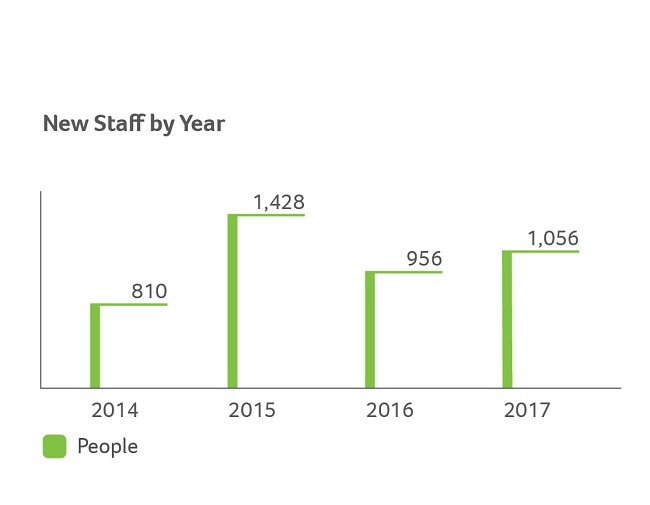 As of the end of December 2017, Acer employees 7,046 people in 40 countries worldwide, including 1,473 managers, 2340 specialists, 743 administrative staff, and 2,490 technicians. Of these, 2,844 are working in the Taiwan region, 1,601 in the Europe region, 1,955 in Asia, and 646 in the Americas. 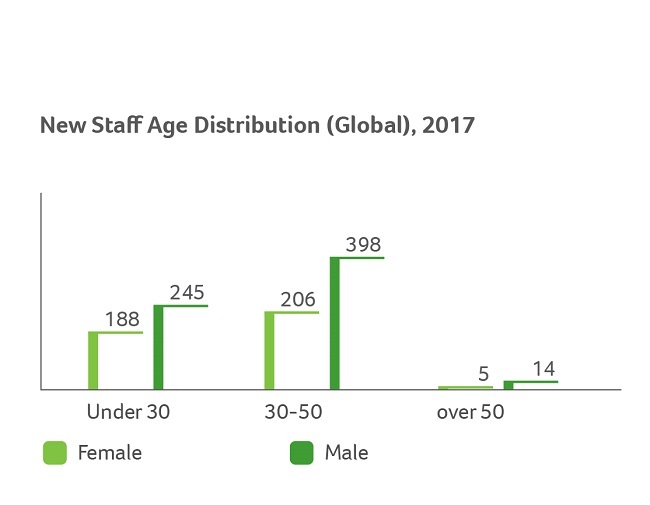 Their average age is 38.7, and their average length of employment with the Company is eight years. Other contracted and temporary staff number 766, of which 575 are male and 191 female. Acer attaches importance to human rights and gender equality among its workers. 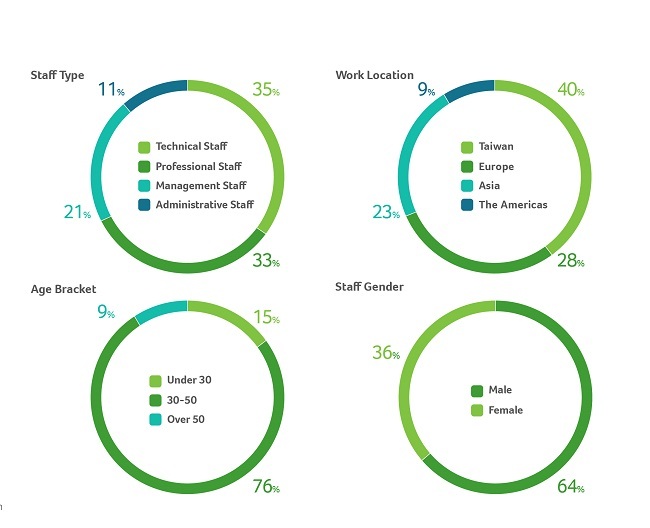 The proportion of female employees has increased year by year. 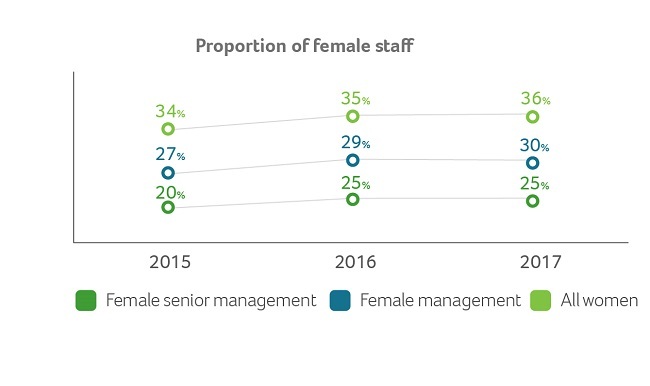 As of 2017, female staff accounted for 36% of total staff, 30% of management, and 25% of senior management. Wherever we are in the world, we strive to adhere to the local labor laws when hiring staff and focus primarily on recruiting locally. We insist on being an equal opportunity employer, hiring through an open selection process that does not discriminate on the basis of ethnicity, gender, age, religious belief, nationality, or political affiliation. We neither tolerate nor accept child labor, and by offering talented people opportunities to make use of their skills in the most appropriate ways, we have assembled a diverse team of outstanding people. 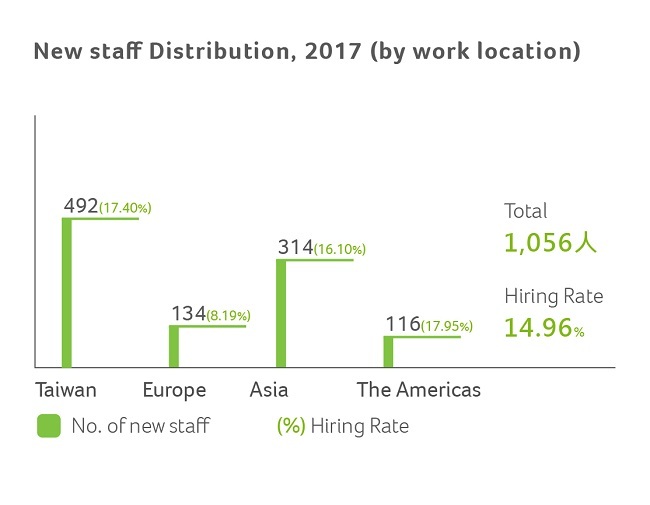 In 2017, the global average percentage of staff who were new hires was 14.96%. 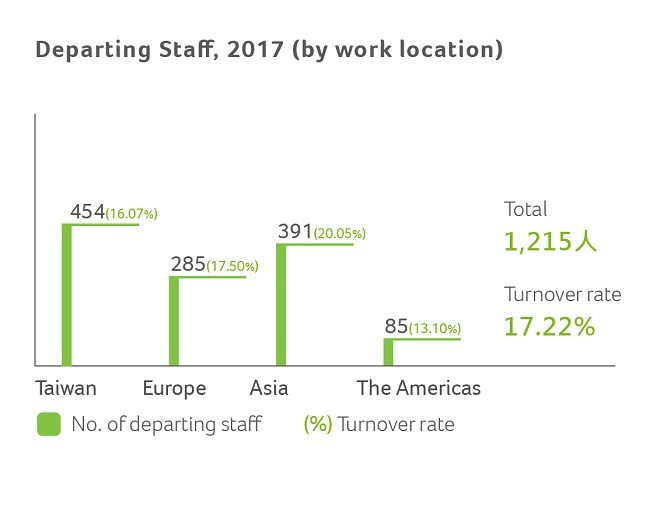 With Acer Group entering new industries and areas including smart transportation, medical care, virtual reality, and augmented reality, the Company faces new challenges regarding staffing and skills compared with the familiar field of computer hardware. 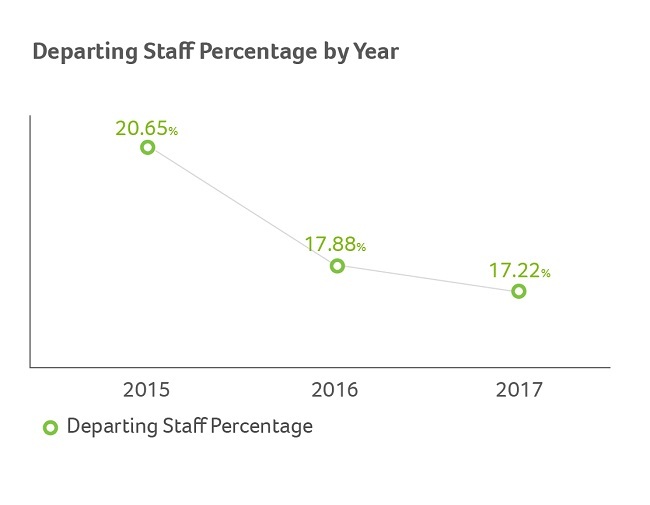 In 2017, average turnover rate was revised down slightly to 17.22%.